2 by 3 Heroes: A quick shout out to many of you. Ever been waiting for something, only for it to end up being WAY MORE than you expect? Here's what I pulled out of my stuffed mailbox today. I knew that little PWE was on it's way to me. And one of the packages I sort of knew about, but I wasn't expecting it anytime soon. The other two? Completely out of the blue. So if you see yourself in the photo - thanks a TON! 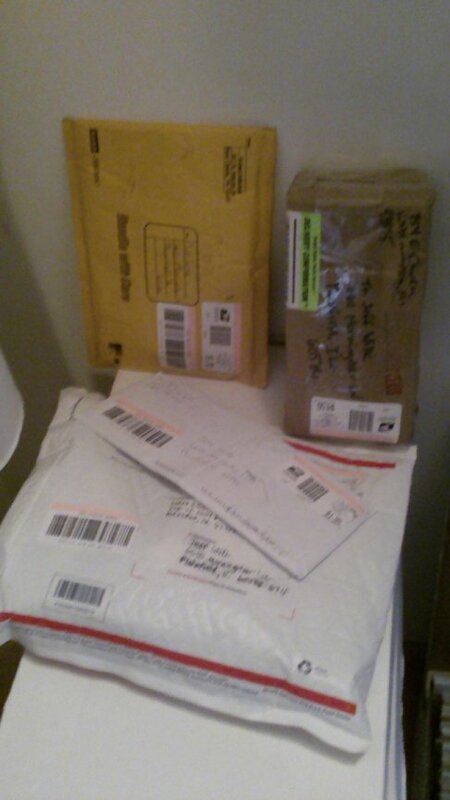 I cannot wait to open them all and post about the goodies within. To all that I have traded with this year, shared a box break, chatted about anything or just had a cyber friendship with - you are all awesome people. Thanks for letting me be a part of this ragtag group of nutlogs. If we haven't traded in the past, let's make one happen soon. If we have made a trade before, let's trade again. Check out my trade pages at the top and email me - you would be surprised what I would give up for what you have. Please hang around and take part in my giveaways. One was posted the other day right here - join in. I will be posting another giveaway tomorrow, and I am looking towards the larger "something for everyone (hopefully)" to go up over the weekend. Then who knows. Depends what else I don't want.